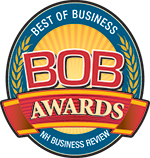 NH Business Review's BOB Awards recognize the best New Hampshire companies in more than 80 business-to-business categories, as chosen by our readers. • This is a New Hampshire poll. Please vote for New Hampshire businesses, organizations and places only. • Each category is pre-populated with businesses that have received a significant amount of votes during previous BOB Award ballots. Some are past winners, some are Editor's Picks and some have never won before but are top vote getters. • Each category has a write-in option if your choice is not listed. • If you do not have a business preference for a category, please skip it and leave it blank. • In order for your entry to count, please answer at least 15 questions. • Only one ballot entry per person will be accepted. Multiple entries from the same person will be considered "stuffing" the ballot. • The ballot will remain open until midnight on January 18, 2019. Q: Do you only list advertisers in in the pre-populated choices? A: NO! This is an editorial poll based on the votes of our readers. Many of our winners are not advertisers and purchasing advertising in NH Business Review does not secure a business a win. Q: How does a business end up in your pre-populated choices? A: The businesses included in the multiple choice options are businesses who have either won a BOB Award before or who have received a significant number of votes or write ins in the past. Generally speaking, those who appear on the list have all received at least 5% of the vote in their individual category. Businesses who receive less than 5% of the vote may be removed from the ballot the following year. Q: When will the winners be revealed? A: Winners will be contacted in early February regarding their win. The complete list of winners will appear in a March 2019 issue of New Hampshire Business Review. Q: What about the fantastic annual BOB Awards party you throw -- when is it? A: Winners will be celebrated at the annual BOB Awards party on Thursday, March 14, 2019 at the Grappone Conference Center in Concord, NH. This event is open and welcome to everyone! Please note: NH Business Review and McLean Communications reserve the right to eliminate, add and edit categories and drop-down choices at any point during the voting period. NH Business Review and McLean Communications reserve the right to disqualify any business from the BOB Awards ballot that it believes, in its sole discretion, is not in good standing in the New Hampshire business community or has interfered in any way with the fair administration of the voting. NH Business Review and McLean Communications will have the final say on winners in all categories. "Stuffing of the ballot" is strictly prohibited, and if a business or person is suspected of this, New Hampshire Business Review and McLean Communications reserve the right to disqualify those ballots. If applicable, our Awards committee may also deem more than one winner per category. I.e., there may be a local and a regional winner for certain categories. * 2. I have read and understand the rules and information stated above regarding the layout and format of the 2019 BOB Awards ballot and I am now ready to vote for NH's best b-to-b businesses and services!